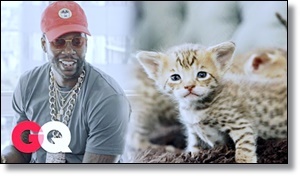 2 Chainz, meet kittens. Kittens, meet 2 Chainz. The "I'm Different" rapper has been busy exploring the finer things in life for GQ's Most Expensive Sh*t series, giving everything from $48,000 sunglasses to diamond-infused vodka a spin. Next up on his lavish list? Meeting some of the world's most expensive cats, of course. There are several important takeaways in this video, chief among them that 1.) 2 Chainz can't whistle and 2.) an exotic serval kitten goes for a cool $15,000. If you're in the market to drop as much money on a cat as, say, a semester of college tuition, this one's for you.